The classic Stan Smiths trainer has been given a funky makeover in an exhibition celebrating the diversity of sneaker culture. 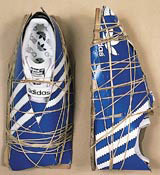 Among those creating customised versions of the shoes are consultancies Digit and Third Planet, graffiti artist Banksy, Kylie Minogue’s clothes designer Fi Jones, graphic designer Anthony Burrill/Bless the Artist, design collective Shynola and three Royal College of Art undergraduates – Ben Wilson, Anthony Ellis and Tom Woolner. Third Planet’s contribution, by creative director Mark Woodhouse and designer Matt Naylor, features an image of actor and ‘real geezer’ Steve McQueen. The exhibition, Unlocked, runs at the Foot Locker store on London’s Oxford Street until 6 June.